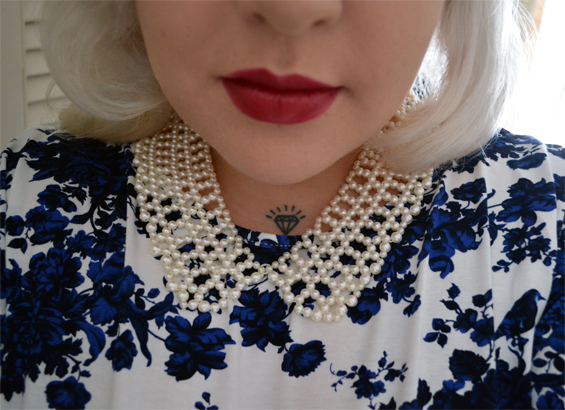 Porcelain & Pearls - An Outfit Post - Sugar, Darling? Aaaah I've been lusting after a 'blue willow' pottery-esque print piece of clothing for so long! Unfortunately the few pieces I've seen have been either mega bucks or from Primark so were pretty poor quality and not a good fit. Finally I found this piece in South's new collection and added it to my basket without a second thought. I was so keen in fact that I didn't even notice the nice little detail to the back of a v-line with crossover straps - very cute! 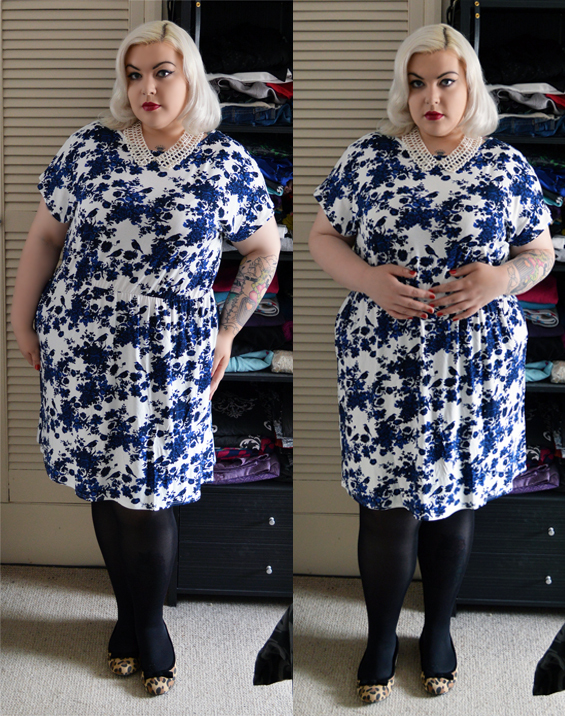 The dress itself is a light flowy fabric (mainly viscose) and it hangs and moves very nicely. 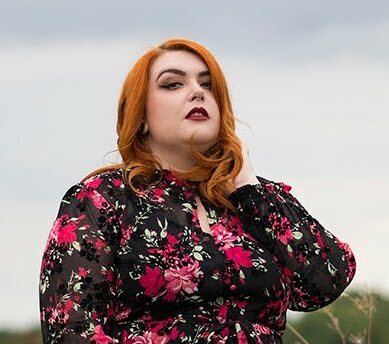 The cut of the shoulders/arms is nice shape making it comfortable and flattering and the skirt length is just right for wearing with leggings, tights or nothing at all. The elasticated waist gives you a helping hand defining your waistline if that causes you problems and also helps the dress shape nicely at your back. The print of the dress is actually a lot darker and not quite as detailed as the website image shows, but if anything this makes it brighter and bolder so it's fine by me! I teamed it with a little pearl collar and some leopard print block heel shoes which I picked up for £3 in a Primark sale at some point. This lipstick is a new favourite of mine, my MIL bought it for me from one of the charity make-up sales that go to her work every now and again - why don't I get make-up sales at work?!?!? It's L'Oréal Paris's Color Riche in shade 376 'Cassis Passion' and is just lovely. A bold pinky red which can be worn both day and night, it's super creamy and rich. It is also enriched with Vitamin E to moisturise, so you can wear it all day long without suffering from your lips drying out or chapping as can be the case with so many richly pigmented lipsticks.